Since shifting all my plants from my neighbour's house, back to my house, with some makeshift arrangements for my plants, this is the first thing to happen. The amaryllis bulbs, that I got last year, have now started blooming. 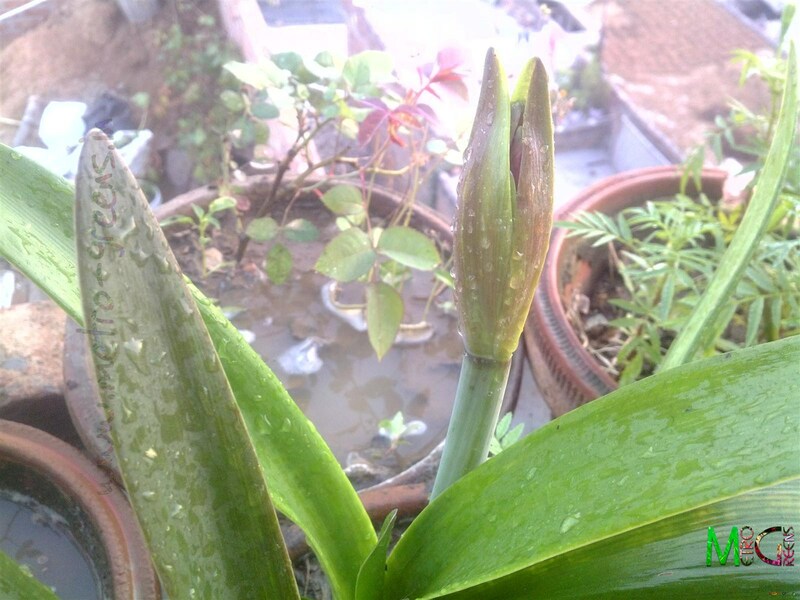 Just a few days back, I noticed an amaryllis bud - the first one. In all these years of gardening, this is the first time, I got lilies, and this is the first time, it'll bloom. For now, I have captured the bud that's there, and will share the bloom with you all once it blooms in the next few days. For now, I can just make out that the bud which is about to bloom is a red one. So, looking forward to another pretty bloom of the amaryllis. The amaryllis lily bud, the first one. I've planned getting more varieties of lilies to add variety and colour to my garden, so, will share those too whenever I'm able to get them. I'll be back with some new posts once I start the makeover and redesign of my potted rooftop garden, adding more plants, including some creepers too. Also, I have the grapevine in shape, all ready to be back with a full-fledged show of inflorescences and the grapes too. So, upcoming are some interesting stuff from my rooftop garden. Till then, keep visiting and happy gardening!